MARCH 5—With the twin island federation of St. Kitts and Nevis hosting the 44th Carifta Games in less than a month, its hurdlers are heading to territory for a final tune up during Friday’s BVI Athletics Association Development Series meet, which comes ahead of next weekend’s Premier Dental National Jr. Championships. 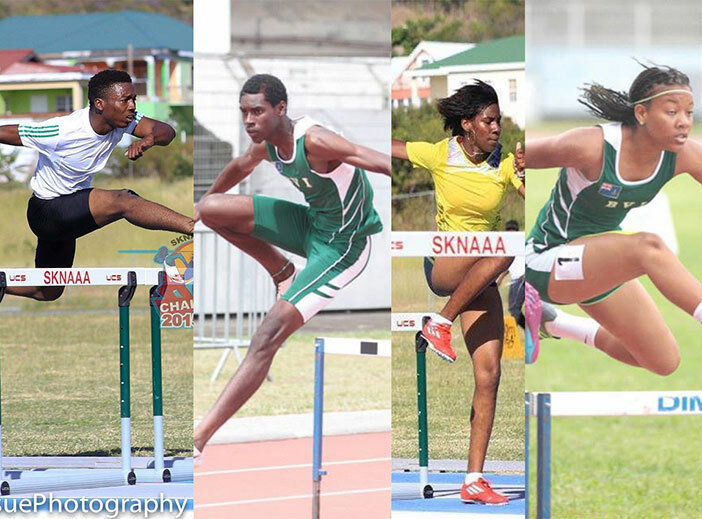 A female 100m Hurdler and four 400m Intermediate Hurdlers from Sugar City, will be using the competition as their qualifier for the Carifta Games, the regional premier Jr. Championships set for April 3-6. Coach Donnell Esdale will be bringing St. Kitts and Nevis’ 400m National Record holder Oneil Thomas who ran a best of 53.04 seconds to win the 2014 national title and Youth Olympic Games finalist Akeem Chumney, who ran 53.00 last year in the U18 Division. They will meet BVI record holder Kyron McMaster who ran against Chumney at the 2014 Carifta Games where he ran 52.97 seconds for the bronze in the U18 division. McMaster has run 53.26 over the U20 Division hurdles in which the trio will face off in Friday night’s last event. Aljani Bridgewater who has run the U18 division barriers in 56.71 seconds will also see action. Female hurdler Kiesshonna Brookes, who has a best of 14.45 seconds in the 100m U18 division, will get her tune up against National Youth Record Holder Deya Erickson, who has a best of 14.16 seconds. Erickson, a 2014 Youth Olympic Games participant, ran 14.32 to finish fifth in last year’s Carifta Games. Friday’s competition begins at 5:30 p.m. Field events include:1. Baseball Throw U19, U11, U13 (17:30).2. Shot Put U18, U20 & Open (17:30). 3. Long Jump U11-13-15-18-20-Open (17:30) 4. Discus Throw U18 and Open. Running Events: 150 Meters U9, U11, U13, U15. 200 Meters U15, U18, U20 & Open. 600 Meters U13 & U15. 800 Meters U18, U20 & Open. 100M Hurdles Open and 400m Hurdles Open.